The holidays all about spending time with friends and family. You’re meant to slow things down so that you can enjoy not working. There will be plenty of time in the New Year for you to speed things back up. Although there’s one thing that you could take care of fast even before too much of the New Year has gone by. That would be getting rid of your clutter with help from Junk King Richmond. This is not the crew you want to hire toss out some magazines. But instead, you can turn over to them all the unwanted stuff it’s been collected in your home that can’t fit into the trashcan. That can make a huge difference around your house for sure. Junk King Richmond is all about taking the stress out of getting rid of your stuff. You might think that is too difficult to move a sofa up from the basement. Or that it’s too much of a challenge to get rid of a piano in a back room. Those the kinds of things Junk King Richmond does on a regular basis. They’ve seen all kinds of cleanup jobs from abandoned homes to hoarder level cleanouts. There’s nothing you’re going to ask them to remove that they haven’t already removed. Before the crew shows up for your appointment you just need to be clear with exactly what you want to toss out. That might mean spending a little bit of time sorting through boxes in your closet. But when you consider the trade-off of reclaiming all that valuable storage space it’s a good use of your time. Plus, won’t it be nice to start the New Year in a home that’s free of clutter? Everything that’s collected by Junk King Richmond has a chance to be recycled. This is part of their eco-friendly disposal policy that’s been in effect since they started collected junk over 10 years ago. In that time, they’ve diverted several hundred tons of rubbish away from local landfills all across the country. That’s having a very positive impact on the environment. And it’s all included in the flat fee you’ll be charged by Junk King Richmond. 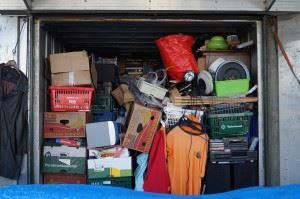 If you want to get rid of your clutter the fast and affordable way, then Junk King Richmond is the company to call. This entry was posted in junk removal and tagged clutter, Junk King, junk removal on December 27, 2016 by Bill Taggart. Last updated August 17, 2017 .